This will be the largest development WCHG have undertaken at 147 units on former school playing field behind the Manchester Enterprise Acadamy. 109 houses and 38 flats will be built on the site. The contractor undertaking the work will be Willmott Dixon and works are expected to be completed summer 2020. Scheme Details Our contractor Willmott Dixon will be starting on site on the 16th of July. 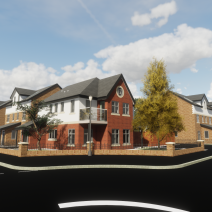 Works are planned for completion in three phases with a show house and marketing suite the first to be ready in spring 2019.